Wealthfront is one of the largest and fastest-growing robo-advisors in the U.S. with more than $12 billion in assets under management (AUM). Like other robo-advisors, Wealthfront offers online financial services and advice without much human intervention. Its services are completely automated. There are no human financial advisors who you can talk with. The company’s goal is to simplify the investing process by automating as much as possible. Answer a short questionnaire and it will create an investment plan that is personalized to your risk tolerance and your goals. In addition to investment management, the robo-advisor offers free financial planning and short-term cash management. There are no human advisors at all. If you think you'll want access to human advisors, you'll have to look elsewhere. Pricing: How Much Does Wealthfront Cost? There are no other pricing plans with special features but investors with at least $100,000 and $500,000 receive additional management services. There are no trading commissions. You’ll never pay fees to purchase ETFs. The only other cost to keep in mind is the operational fees that individual ETFs charge. These fees are generally less than 0.15% but may be over 0.40% in some cases. When you open an account, you will need to answer a short questionnaire about yourself, your income and your investing goals. This questionnaire helps the company to understand your risk tolerance and what you want from your portfolio. The company will then create two personalized investing plans for you. One plan is a portfolio for a taxable account and the other is a portfolio for a retirement account. You can then choose to create an account using either one of those plans. There is very little customization available for these plans but you can change your risk tolerance at any time. Like most robo-advisors, this one uses an investment philosophy called modern portfolio theory. Modern portfolio theory was developed by Dr. Harry Markowitz and it won him a Nobel Prize in 1990. The idea behind the theory is investing in a diversified portfolio, across multiple asset classes, in order to maximize your returns. 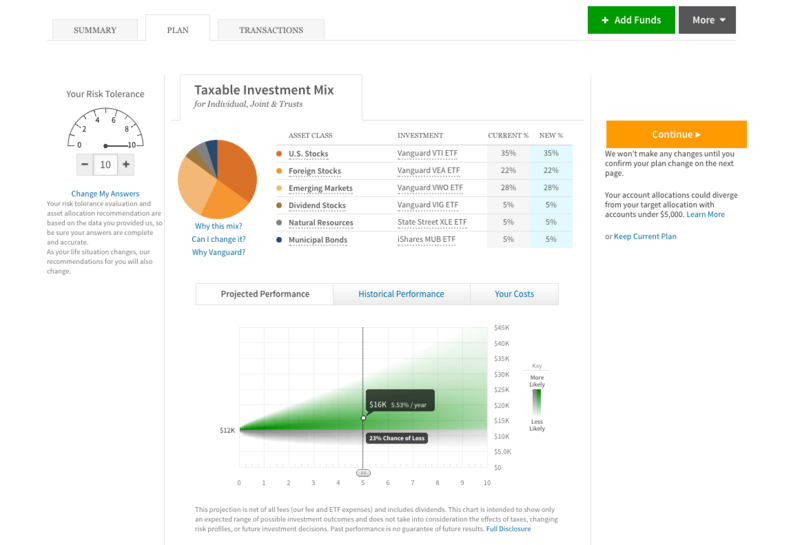 Wealthfront has 11 potential asset classes that it could use to build your portfolio. A typical portfolio consists of ETFs from six to eight asset classes. All portfolios are made with ETFs. Individual stocks are not used. If you want to know more about a specific class, there are graphics you can click on to learn more. The company makes a point of being transparent with where and how it invests your money. After your portfolio options are created, you can choose one and create an account. Individual taxable accounts, Joint and trust savings accounts, traditional IRAs, Roth IRAs, SEP-IRAs and 401(k) rollovers are offered. 401(k) accounts are not currently available. One of the company's investment keys is having a well-balanced and diversified portfolio. Automated portfolio rebalancing, which is done daily by software, ensures that your portfolio stays balanced and diverse. Account rebalancing is one instance where it’s beneficial to have computer software managing your investing. With a human broker, you would likely have to meet in person to go over rebalancing your portfolio. Because of the time and money involved in meeting face-to-face, you might end up rebalancing your portfolio as little as once per year. Software does all the work so your portfolio gets balanced daily without the need to meet or even talk with anyone. There's also a suite of investing features offered called PassivePlus®. PassivePlus® offers tax-loss harvesting, stock-level tax-loss harvesting, risk parity and smart beta. The availability of each of these features will depend on your account value, though tax-loss harvesting is available to all investors. With the exception of risk parity, which carries an additional fee of 0.03%, all of these features are available at no additional cost. However, they only apply to taxable accounts. Tax-loss harvesting is a common portfolio management practice. When ETFs in your portfolio lose value, they're sold at a loss. The losses are then used to offset the taxes you pay on your gains. At the same time, the company will purchase a similar asset to the one it sold in order to keep your portfolio in balance. Wealthfront has established models that sell and buy ETFs at the right time to maximize your tax benefits. Stock-level tax-loss harvesting is an enhanced form of tax-loss harvesting and only applies to accounts with at least $100,000. Instead looking at ETFs or index fund to invest in U.S. stocks, direct indexing looks for movement in individual stocks (the stocks that comprise the funds). This allows the company to harvest more losses and lower your tax bill even more. Risk parity, which is also only available to accounts with at least $100,000, is an alternative approach to asset allocation. Similarly to modern portfolio theory, it uses risk to determine how to allocate capital across multiple asset classes. Instead of focusing on risk and return, however, risk parity aims to match the risk levels of each asset class. Smart beta only applies to accounts with at least $500,000. Index funds (like the S&P 500®) traditionally weigh stocks in proportion to their market capitalization. This means that index funds will invest more of their funds in the stock of a large company and less in the stock of a small company. Smart beta is a strategy that considers more factors than just market capitalization, and advanced indexing is Wealthfront’s version of smart beta. Wealthfront looks at six factors when deciding how to weight the stocks in your portfolio. In addition to its myriad investment services, Wealthfront also offers free financial planning. You don't need to have an investment account with Wealthfron to start a plan. The plans are based on a variety of data, including from a person's bank, brokerage, 401(k), credit cards and mortgages. If you choose to link your accounts to Wealthfront, you won't have to manually update your information when your financial situation changes. Wealthfront combines this information with data collected from sources like Zillow and Redfin for real estate planning and the Department of Education for college tuition planning. The financial planning service can help you determine how much you should be saving, as well as plan for more specific goals like retirement, buying a house, saving for college and taking time off of work to travel. The third category of services Wealthfront offers is short-term cash management. 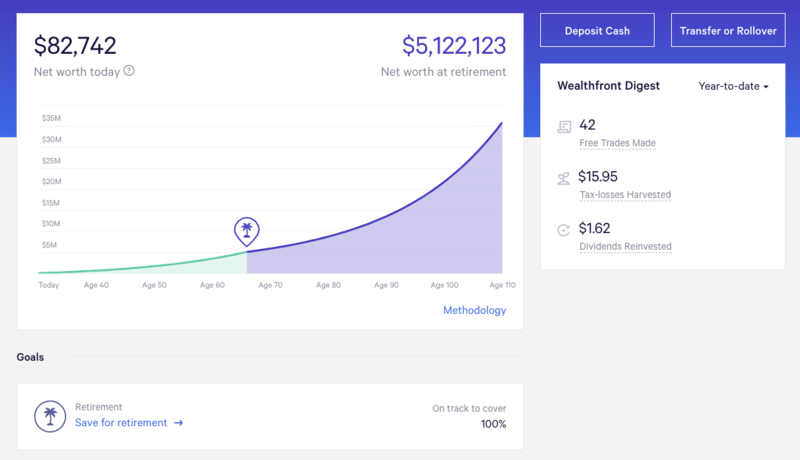 The robo-advisor offers Wealthfront Cash Account, which offers an interest rate of 2.24% and is FDIC-insured up to $1 million. There's also the Portfolio Line of Credit, in which clients with at least $100,000 in a taxable account are automatically enrolled. This establishes a line of credit that's accessible without paperwork or a credit check for as much as 30% of your account value. Lastly, there's the company's invite program, which is a referral program that eliminates the management fee on $5,000 of assets every time you invite someone who creates a Wealthfront account. Anyone you refer also gets the $5,000 bonus. If you are a big influencer, this program has the potential to save you a lot of money. Someone who invites five people would get $25,000 of fee-free investments (5 x $5,000). Wealthfront has a low annual fee and is open to anyone who can invest at least $500. More specifically, the robo-advisor is geared toward the average investor who wants to invest her money for the long-term without having to do the work. Its services are completely online. This is a great option for someone who doesn’t want or need to meet with a real person to talk about his investments. It likely won't be appropriate for someone who isn't digitally savvy and comfortable with woring entirely online. With Wealthfront’s referral program, your first $5,000 is managed for no fee. This could make Wealthfront a good choice if you have a few friends who you can also invite to start investing with you. Wealthfront is an SEC-registered company with a strong reputation. When people talk about robo-advisors, it's one of the best-recognized names. Brand recognition isn’t everything, but some people will feel safer working with one of the biggest names in the industry. If money is tight and you have the know-how to do your own investing, you could save money by eliminating the middleman. Wealthfront puts investors’ money in Vanguard ETFs. You could save on fees by investing directly in Vanguard ETFs. This is true of many robo-advisors including one of Wealthfront’s biggest competitors, Betterment. The trade-off is that Wealthfront’s services will save you a lot of time and work. You can start an account by going to Wealthfront's website. The website offers useful information about the company, its features and about investing in general. The website also offers contact information (email and a phone number) in case you have further questions. But how do you actually open an account? On the website there is an “Invest Now” button in the top corner. You click on the button and it will take you to a short questionnaire, which is eight simple questions about you, your income and your investing goals. As soon as you finish the questionnaire, Wealthfront will calculate two personalized investing plans based on your answers - one plan for a taxable account and one for a retirement account. Your plans will appear as a graphic that shows the asset classes where your money would be invested. The company generally creates a portfolio of six to eight classes. If you want to know more about a specific class, you can click on the graphic to learn more. For example, let’s say Wealthfront recommends investing 20% of your portfolio in foreign exchanges, but you don’t know anything about foreign exchanges. You can click on the foreign exchanges in your recommended portfolio to learn more about foreign stocks, about the leading ETFs for foreign stocks and about the yearly expenses (fees) you can expect from those ETFs. Wealthfront will also calculate your risk tolerance. Risk tolerance is the amount of variability you can handle with your investments. If you have a low tolerance, you wouldn’t handle it well (financially) if the stock market made a big down turn and the returns from your stocks went down. If you have a high tolerance, you can more easily handle fluctuations in the market. After answering the online questionnaire, your personal risk tolerance is assessed on a scale from one to 10. This is a recommended level that you can change. You can also change your risk tolerance in the future if you, say, experience a major life change like a big change in income. After reviewing the recommendations, you can select the option to open your account. This will start your application. Enter an email and password, choose your account type (e.g. traditional IRA or 529 college savings plan) and enter your personal information. The final part of your application is to transfer money into your account. Then you can submit your application. Once your account is approved, you can log in either online or through the mobile app to access your dashboard. The dashboard lets you view an account summary, view your investing plan, track your transactions and access documents. Come tax time, you will be able to find your 1099 tax documents through the dashboard. Wealthfront also integrates with TurboTax, making it easier to file your taxes. Robo-advisors like Acorns can simplify the saving process, but some people prefer being able to ask questions face-to-face. This is particularly useful if your financial situation is a bit more complicated. For example, you may have have multiple savings goals for both the short-term and the long-term. If you have children, you may want to invest for retirement slightly differently in order to maximize the tax benefits. No matter your personal situation, talking with a financial advisor who is a real person can help you to create a more comprehensive plan than robo-advisor can. It will also allow you to combine your retirement planning with your other financial goals and tax considerations so that you have one financial plan to cover your entire life. Robo-advisors help to simplify the investing process, but Wealthfront is not the best choice if you prefer discussing your investments with another person. Wealthfront’s services are completely automated and online. There are no human financial advisors. For some people, this is a selling point. You don’t have to worry about the hassle of face-to-face meetings or phone calls. For others, the lack of real advisors is undesirable. In that case, there are other robo-advisors that offer access to full-time or part-time human advisors who you can talk with. You should also consider talking with a traditional financial advisor. Whether you choose a robo-advisor or a human advisor will also depend on your individual situation. People with more complex taxes or other complicated financial situations may benefit from a more comprehensive financial plan. This is something a human advisor can help with because he or she will look at your entire financial picture to make a plan for you. Just talking once or twice with a financial advisor may also help you to find a general heading for your investing future. 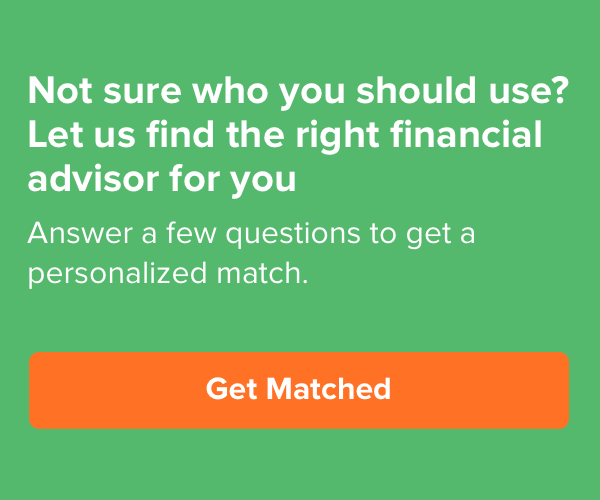 You can find the right human advisor for you with SmartAsset's financial advisor matching tool. A minimum investment of $500 is required to invest with Wealthfront. Some robo-advisors have no minimum. At the same time, some of Wealthfront’s features aren’t available to everyone. Stock-level tax-loss harvesting, risk parity and Portfolio Line of Credit are only for accounts with at least $100,000. Smart beta is only available for taxable accounts of more than $500,000. Competition: How Wealthfront Stacks Up? This robo-advisor’s closest competitors are Betterment and Wealthsimple. Wealthfront requires a minimum investment of $500, while neither Betterment nor Wealthsimple require a minimum investment. Wealthsimple will also manage your first $5,000 for free. Betterment and Wealthsimple also both offer two different investing options. Betterment's first (and cheaper) option is called Betterment Digital, while Wealthsimple's first option is called Wealthsimple Basic. While Betterment Digital charges the same 0.25% fee as Wealthfront, Wealthsimple Basic charges a much higher fee of 0.50%. Betterment Premium and Wealthsimple Black both require a minimum investment of $100,000 and an annual fee of 0.40%. Wealthfront charges lower fees overall than Betterment and Wealthsimple but the biggest difference is that both Betterment and Wealthsimple offer access to human financial experts. Wealthfront is completely online with no human financial advisors. However, Wealthsimple gives all investors access to human advisors, while Betterment only provides access for Betterment Premium investors. The Betterment Premium plan, which requires a minimum investment of $100,000, includes unlimited phone consultations with a Betterment financial planner. Wealthsimple Digital, which requires no minimum investment, offers access to a human advisors through phone call, text and email. 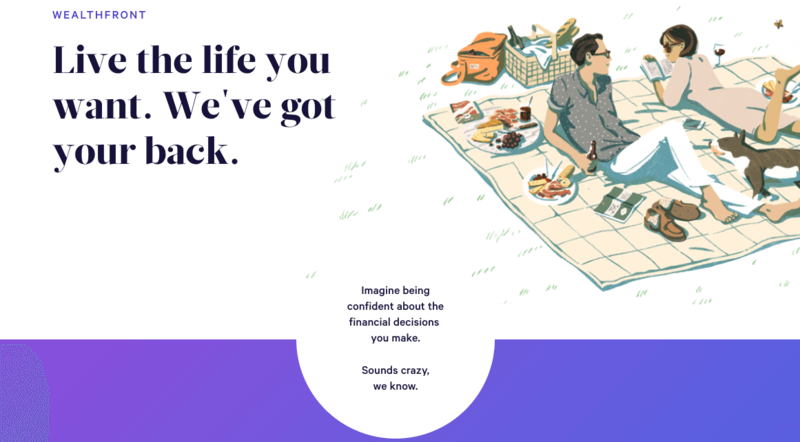 Wealthsimple Black, which requires a $100,000 minmium investment, offers financial planning sessions with human advisors. Betterment does not offer direct indexing at any level. Wealthfront and Wealthsimple provide direct indexing (which Wealthfront calls stock-level tax-loss harvesting) for no additional cost once your account hits $100,000. Both also offer additional features if you invest more than $500,000. Remember though that tax-loss harvesting and direct indexing don’t apply to retirement accounts. If you use either robo-advisor for an IRA, these features won’t affect you. Your main concern with an IRA would be management fees. Bottom Line: Should You Use Wealthfront? Wealthfront is a great, low-cost option for online investing services as well as software-based financial planning and short-term cash management solutions. Wealthfront is best for people who are comfortable working exclusively online and who are interested in long-term investing. It offers a number of account types. Its flat-rate fee of 0.25% is hard to beat. Investors with more than $100,000 get the benefits of stock-level tax-loss harvesting, risk parity and Portfolio Line of Credit. Investors with more than $500,000 will also get access to smart beta. The thing to remember is that this robo-advisor is completely automated and online. There are no human advisors who you can discuss your investments with. This may be a drawback for some people but a selling point for others. If you are looking to invest, it’s smart to start by talking to a financial advisor. A financial advisor can help you create financial financial goals so that you understand what you should be trying to do as you invest. For example, you don’t want to open a regular brokerage account if your primary goal is building retirement savings. Unlike many other robo-advisors, Wealthfront supports 529 accounts. If you’re trying to save for college, it’s a good idea to start with this guide on everything you need to know about 529 plans. SmartAsset’s interactive map highlights the places in the country where people are the most financially savvy. Zoom between states and the national map to see where people are smartest when it comes to managing their finances. Methodology Our study aims to find the places where people are the smartest when it comes to managing their finances. To find these financially savvy places, we looked at three factors: credit utilization, late payment rates and personal savings rates. The credit utilization represents the average credit card balance as a percent of credit card limit. The late payment rate represents the average number of late payments in a billing cycle. To calculate the personal savings rate, we looked at data from the Bureau of Economic Analysis (BEA) on the average income per capita for each city in the U.S. We then applied an estimated tax rate to that number to determine disposable income per capita. Next we subtracted the average spending for someone at that income level, which includes things such as consumer spending, charitable giving and interest on debt. Finally, we divided the amount leftover, the savings per capita, by disposable income per capita to determine the personal savings rate. To calculate the Financially Savvy Index, we weighted credit utilization 30%, late payment rates 35% and personal savings rates 35%. We ranked the cities on each of the categories and then indexed each category. We then added those indices together and indexed that. A financially savvy city means people there have low credit utilization, low late payment rates, and high personal savings rates.